Hal was born in Houston Texas and started to play guitar at the age of 12. When he was 14 he went to a friend’s band practice and their bass player didn’t show up so he was asked to see what he could do. Little did Hal know, but that moment would shape the rest of his playing career. A bassist was born! He performed in a few bands in the Houston area till he answered an ad from a couple guys from Colorado. Greg Gill and Eric Halpern were putting together a band that would eventually become Houston’s own Z-Lot-Z!!! After what seemed like a hundred drummers the band finally were ready to hit the scene! About 2.5 years in he needed to move to Omaha to be closer to family. Hal ended up in a touring band out of Fargo, ND and hit the road touring the Midwest and Canada. Currently Hal is playing regional shows, festivals, rodeos, casinos and clubs in and around Omaha and surrounding states on a weekly basis. 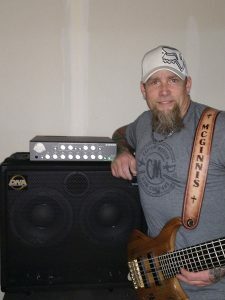 About his DNA gear… “When I received my new DNA-1350 amp I was literally heading out the door to a gig, so I decided I’d take it with and mess around with it at sound check. I was blown away at the ease of dialing it in with the 4 band eq and the awesome built-in compression, and sweep control!! Paired with my DNS210 cabinet the sound coming out of the speakers was huge for its size and light weight (the 210 sounds bigger than other 410’s I’ve played over the years)!! The front-installed tweeter control is just awesome to be able to switch from a growly low end grind to a funky slap sound with a turn off the knob! I am thrilled to be a part of the DNA family and look forward to adding more DNA gear to my rig soon! Thank you John Vitale and DNA”! !